Western blot analysis of extracts from various cell lines using MIF Antibody (upper) and β-Actin (D6A8) Rabbit mAb #8457 (lower). 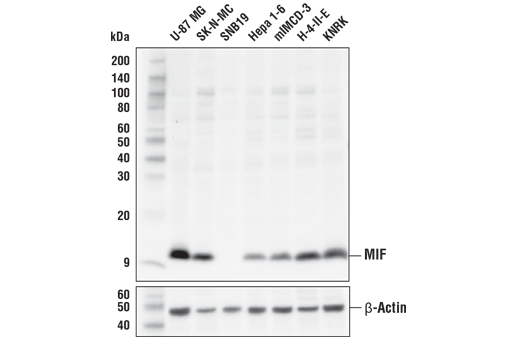 MIF Antibody recognizes endogenous levels of total MIF protein. Polyclonal antibodies are produced by immunizing animals with a synthetic peptide corresponding to residues surrounding Tyr100 of human MIF protein. Antibodies are purified by protein A and peptide affinity chromatography. MIF (macrophage migration inhibitory factor) is a pleiotropic cytokine that stimulates pro-inflammatory, chemotactic, and growth responses in cells (1). MIF binds its cognate receptor (a CD74/CD44 complex) to activate multiple signaling pathways such as Src, ERK, MAPK, Akt, and suppress p53-induced apoptosis (2). The interaction of MIF with non-cognate chemokine receptors CXCR2 and CXCR4 promotes chemotaxis that enables recruitment of monocytes/neutrophils and T cells (3). During an innate immune response, MIF has been shown to repress the inhibitory effects of glucocorticoids on macrophages and T cells, thus promoting host inflammation and immunity (4). MIF may also play roles in the progression of other disease processes, including cancer cell proliferation and metastasis, and angiogenesis (5), atherosclerotic plaque formation following myocardial ischemia (6), and autoimmune pathogenesis (7). MIF has thus been proposed as a promising therapeutic drug target for multiple indications. Sparkes, A. et al. (2017) Immunobiology 222, 473-82. Flaster, H. et al. (2007) Mol Endocrinol 21, 1267-80. Tillmann, S. et al. (2013) Front Immunol 4, 115. Calandra, T. and Bucala, R. (2017) Crit Rev Immunol 37, 359-70. Kindt, N. et al. (2016) Oncol Lett 12, 2247-53. Tilstam, P.V. et al. (2017) Expert Opin Ther Targets 21, 671-83.